Our 2018 “Always in Bloom” botanically inspired theme continues with artist Martha Simpson’s Eco-Print Workshop. Participants will learn the process of transferring images from a variety of leaves onto silk cloth (including discussion of natural dyes). Pre-registration with payment is required. Registration deadline is October 9, 2018. The fee is non-refundable unless there is a participant who can fill your space. Participants should bring a bagged lunch or plan a take-out option. Space is limited, register early! 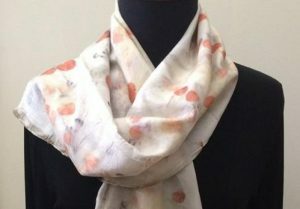 Note: If you’d like to bring additional fabric, there may be a chance for further experimenting (silk and wool will give more intense results, fabric should be pre-washed and no wider than 8″). 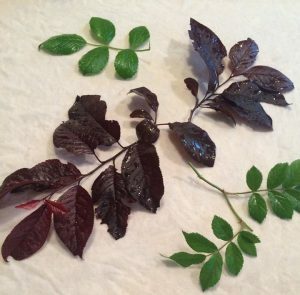 If you have favorite leaves or other natural materials, bring those too! Children age 10 and up, accompanied by an adult, are welcome to join us.